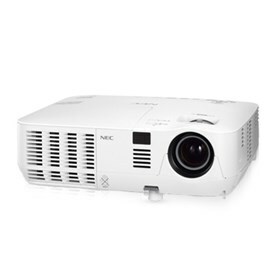 The NEC NP-V311W is 3100-lumen high-brightness widescreen mobile DLP projector with 7w speaker, BrilliantColor™ and ECO Mode™ technology. The projector has HDMI input, dual computer inputs and quick startup/cooling/shutdown. It features crestron RoomView connected™, advanced AccuBlend, AutoSense and built-in wall color correction. The NP-V311W also features auto power on, closed captioning and virtual remote. This 3d ready projector has variable audio out, carbon savings meter and sleep timer. It provides image magnification, kensington lock slot and discreet source keys. The NEC NP-V311W has many exciting features for users of all types. See the NEC NP-V311W gallery images above for more product views. The NEC NP-V311W is sold as a Brand New Unopened Item.